November 2018 – A ground-breaking event to mark the start of restoration work at one of Merseyside’s most historic parks has taken place. 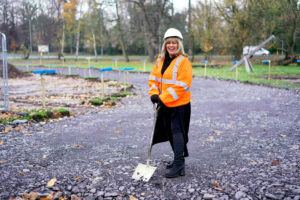 Cllr Shelley Powell, Knowsley Council’s Cabinet Member for Neighbourhoods, attended the ground breaking event to officially launch the start of the £2million restoration project at Bowring Park, Huyton. The project, which is funded by the Heritage Lottery Fund, will see the restoration of the stable block and coach house, the creation of a new café and meeting rooms, parkland landscaping and a park activity programme. The work is expected to be completed by Spring 2019. The golf course will continue to operate while the works are underway, with activities run by the Friends of Bowring Park re-commencing once the work is complete. Knowsley Council recently stepped in to keep the golf course open, following the collapse of the private sector company which ran it. November 2018 – The contractor has now started work on the site to renovate the Coach House and Stables Block and restore the historic gardens. The golf course is still open and the reception is now located in the ground floor temporary container to the right of the main entrance road. Access to areas of the park will be limited whilst the works are being undertaken. October 2018 – Preparations for the restoration of the historic Bowring Park in Huyton are now underway. Temporary accommodation for the golf reception and contractor’s welfare units are now on site, with work on the buildings and gardens due to start in November.